This book captures the essence of what it means to advance the mission of the Church through dymanic witness and evangelsim. It both inspires and issues a challenge to Christians to move from passivity to an active ministry of bold proclamation. 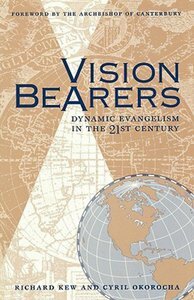 - Publisher Vision Bearers shows how evangelism can be found everywhere, from one-on-one relationships, preaching and small prayer groups, to healings, miracles, church-planting, and the catechumenate. The book also analyzes the challenges to Christian evangelism, including apathy, the rise of militant Islam, secularization and the youth culture. It provides a renewed vision for reaching those in the world who have yet to hear of Jesus Christ. Vision Bearers shows how evangelism can be found everywhere, from one-on-one relationships, preaching and small prayer groups, to healings, miracles, church-planting, and the catechumenate. The book also analyzes the challenges to Christian evangelism, including apathy, the rise of militant Islam, secularization and the youth culture. It provides a renewed vision for reaching those in the world who have yet to hear of Jesus Christ.